RoverPower [github] is ready for field testing. I wanted to eliminate the quirks of Data Bus' old switched regulator and this new design should do so with extreme prejudice. It provides rovers with 5V, 1A from an automotive-grade LM2940 5V 1A regulator [datasheet.pdf] with 6-26V input and low dropout voltage. The current design supports up to 3S battery. With over-voltage, over-current, over-temperature and reverse polarity protection, not to mention the ability to effortlessly shrug off massive voltage spikes from inductive loads, the LM2940 will survive the worst a Rover can throw at it without breaking a sweat. And speaking of which, the board's efficient thermal dissipation design mean you get to use all 1A out of the regulator without thermal overload. Filtering capacitors ensure plenty of clean, stable power for sensitive rover electronics. During initial tests, an earlier version of this design solved spurious resets due to motor voltage spikes on my RedBot (Magician) robot. We saw these symptoms on robots entering the Parker Rover Rally and Data Bus' old regulator would shut down at odd times. This board should solve all of these issues. RoverPower sits between Battery and ESC with 4 pairs of 5V/GND pins for clean, simple wiring. This configuration also sets the stage for an I2C-based voltage/current sensor, RoverMeter [github], based on the INA138 (or INA168) sensor IC that monitors voltage drop across a shunt resistor. Where it's different from the rest of the pack is the addition of an ATtiny onboard that will provide signal processing and an I2C interface so you get stable, accurate measurements. 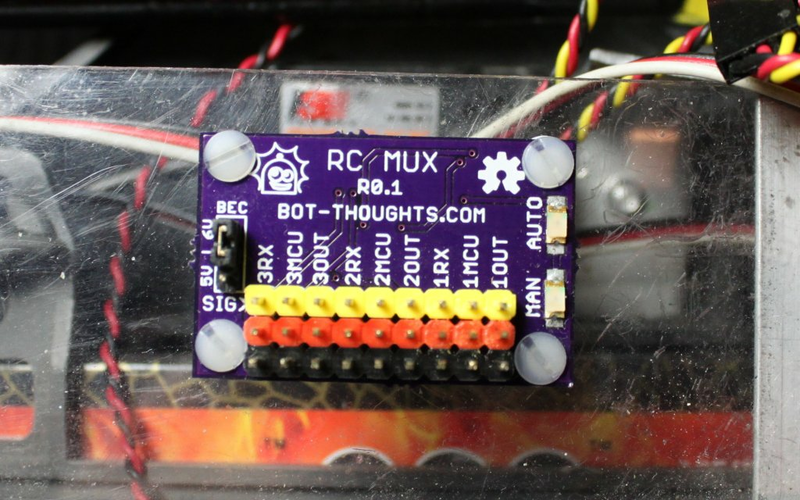 Good ol' RoverMux is still available on Tindie and in its current revision, is as easy as can be to hook up, while remaining dead reliable. It's been saving Data Bus' bacon since 2011. My RoverGyro will need a redesign. The chip it was based on was prematurely declared EOL. What to pick instead? A few folks on the DIY Rovers list have been raving about the Bosch BNO055 [datasheet.pdf] which is actually a 9DOF IMU system-on-chip featuring a built-in ARM Cortex M0 performing sophisticated sensor fusion. Hopefully, too, OpenMV Cam rewards will ship in a few months and go on sale, so folks wanting to employ machine vision will be able to do so. Sounds like you have some good boards in the works! I am a fan of the BNO055, but there are already some good breakout boards for it -- can you add something or improve on it? There is some discussion of the DecaWave DWM1000 on the DIYrover board. (It is a module that lets you do very accurate ranging to other modules -- great for doing indoor and outdoor tracking). Anyway, it looks like there is a need for someone to make and sell a board that adds a microcontroller to it. Oh and maybe a 3.3V version of the power board? I sure hope you enter DataBus in the 2016 AVC! I am a BIG fan of it and your work. I really hope to someday use some of your products in my own rover. Aw, shucks! Thanks, George! :) if we can get OpenMV Cam shipped and I can plow thru some Jeep projects, maybe I can get Data Bus going again by Fall. I'm glad it isn't in June again.